Franklin Field hosted a national championships this past Saturday – the USATF Club Nationals. adidas Garden State Track Club won both team titles, but three HepsNation athletes either won or were a part of three event wins in the one day competition. Emmaline Berg (Dartmouth ’13) entered the Club Nationals as the defending champion in the shot put and discus throws. She left Franklin Field with one of those titles, as she was able to defend her shot put title with a distance of 50-04 3/4. She did medal in the discus – she finished third with 163-10, about 21 feet back of the winner Allison Randall. Berg also finished sixth in the hammer throw (179-01). Berg scored 22 points with these results, helping her club team Shore Athletic Club finish third in the team standings. 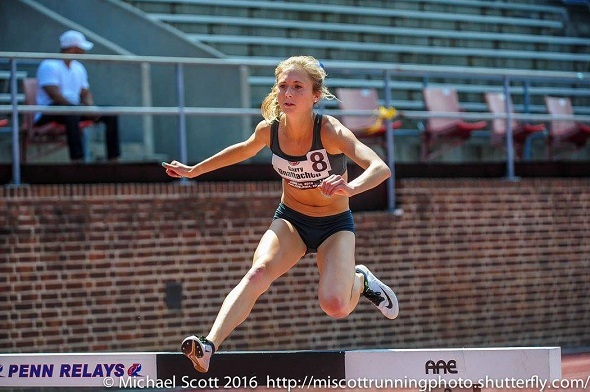 Kira Garry (Yale ’15) came within three seconds of her lifetime best in the 3,000m steeplechase as she claimed her first national title. She won the steeplechase in 10:11.56 – 25 seconds ahead of the next finisher. Like Berg, Erison Hurtault (Columbia ’08) scored in two events, one individual and one relay. He finished 4th in the open 400m (47.12) and then ran the 400m leg of the Central Park TC’s winning distance medley relay in 47.642 (overall team time of 10:11.63). Central Park TC finished third in the men’s competition. This entry was posted on Monday, June 27th, 2016 at 11:00 am. It is filed under Alumni, Spotlight. You can follow any responses to this entry through the RSS 2.0 feed.